For the Month of May students will focus on the virtue of Acceptance. God desires for our children to make friends with everyone, no matter how different they may look or act. 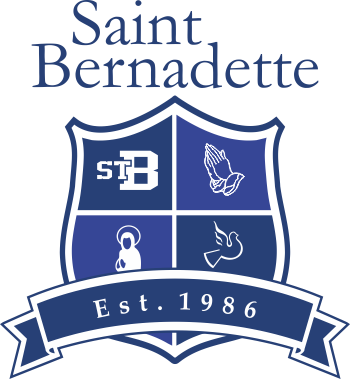 At St. Bernadette’s an accepting person is one who treats everyone with respect, is non-judgemental, is welcoming to everyone, and is loving and happy with him/herself. The virtue of acceptance means we accept ourselves and others just the way we are. God does not make junk. He makes everyone in his image, and therefore everyone is a perfect creation. “If one member suffers, all suffer together with it; if one member is honoured, all rejoice together with it. Now you are the body of Christ and individually member of it” – 1 Cor. 12:26-27. This month we celebrate those in our school are being accepted more fully into the Church through the sacraments of Holy Communion and Confirmation. As Martin Luther King said “God does not love us because we are valuable. We are valuable because God loves us.” and accepts us for who we are. This year’s theme for the Sports/Fun day on Friday, June 12th is “Under the Sea”. We will post the schedule of events in next week’s newsletter. Dismissal will be at 1:00pm. Sports/Fun day is not to be confused with the Year End BBQ which is on Friday, June 5th 5:30-9:00pm in the school gym. Hosted by St. Bernadette School, Designing Minds Camp offers fun, hands-on activities with “LittleBits” electronics for kids to explore the world of robotics and technology. They will practice problem solving, social skills, computational thinking and electronic engineering. The camp runs from August 24th to 28th from 9am – 3pm. Contact Eric Walters erick@mindsunlimited.ca or Theresa Corpus theresa@mindsunlimited.ca for more information. Plans are well underway to make this an exciting year-end event for both parents and kids. There will be food and games to play including a lollipop tree, golf and hockey games, and plinko. There will also be a 50/50 draw and a silent auction. Plus there’s a chance to win great “Golden Ticket” prizes which include $100 towards uniforms, cash prizes, a Designing Minds Camp pass, and an XBOX. We’re still looking for parents who can commit just an hour or two during the event to help run games and activities. If you can help, please contact Camille (ckalaw@gmail.com). And new to this year’s events will be a Cake Walk. Whether you buy or make one, we could use at least 4 cakes from each class to make this a success. If you can help, please contact Stephannie (sdrysdale1@telus.net)by Monday, June 1.